Nov 2013 thru May 2014. 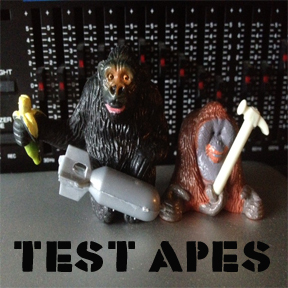 So far, Test Apes has shared 6 tunes, 5 of which will be on the record coming out ...ASAP. But there are another 5 we haven't shared. And since its being released so soon, I figured we'd wait to share those until then...muahaha!...especially since everything shared so far is a ruff mix and unmastered! ...gulp! Anyway, to make things worse, below, for your viewing pleasure, is footage of a jam that became a song that WILL be on the album, called "Humanzees". But you cant even hear my part, except for some slapping sounds, since I'm playing electronic drums, and the audio here is just from the camera in the room. Regardless, it's a pretty good teaser. Plus, Danny shares a little story about the beautiful guitar he uses in the recording. Thanks for tuning in! THE FIRST ONE IS DONE. KILLER! Anyway, he's back home again... and heading over to my place on Monday to get back to work on TEST APES!! Wish us luck, and stay tuned! Also in TEST APE news: I was hired by a local advertising agency to make a fake concert poster to be used as a prop in the background of an IVAR'S SEAFOOD RESTAURANTS ad. It's coming out at some point this month on Seattle TV Stations. 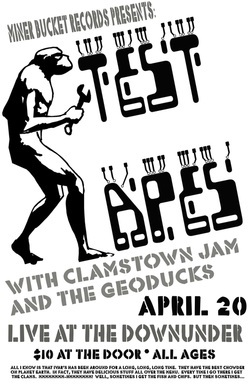 Naturally, I made it a TEST APES poster...and they WENT FOR IT! haw! 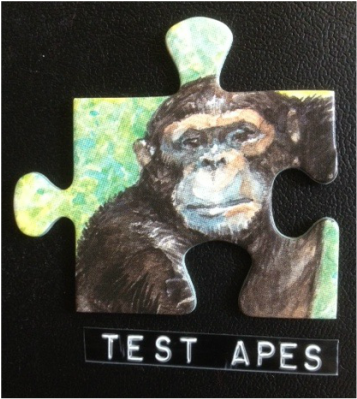 ...and hopefully sneak the TEST APES logo onto the subconscious of the world at large...muahahahaha! Even if you’re not going, or in the slightest bit interested in SXSW...Happy March: the month that Austin gets completely taken over by the music festival year after year. As much as I miss it, I am happy to NOT be in Austin this month, I must admit. But it was there that I went to one of their little 'class sessions with bigwigs' and heard what I thought was a good idea-- and it has recently paid off. I don’t remember the dude’s name, but he suggested that with these “new, cheap digital camera things”, we should be recording anything and everything and putting it on the web since fans absolutely love and crave that kind of footage: a special view into the actual lives, the way they rehearse or interact and do things, etc...SO VIDEOTAPE EVERYTHING. Well, wow, yeah, GREAT IDEA! ...but who wants to edit all THAT?? So, no, I don’t record everything. But I DO record SOMETIMES. And on the 22nd it paid off, as you can see in the video. What I did was film the take of the song as it got laid to tape, which is really rare for little ol’ me. Victory! The video, then, is of the initial jam over at my apartment which we layered other parts over, like bass, vocals, etc... Its not the greatest camera angle, but you can see both of us and it IS the take that made the cut. And no, we don’t high five after playing most songs, but for whatever reason, we did THAT time, lol. We were just figuring the tune out, and captured the moment that the thing kinda clicked together right for the first time, although my face squinches up a couple of times when I almost blow it. By the way, that's not a guitar that he's playing, its some kind of huge bass (I think) mandolin! It has doubled up strings like a 12-string guitar. It sounds super nice in person, I tells ya. Well, Danny’s been on the road for the last month or so playing down in Texas and up into the midwest. But come April, there are plans to finish up more numbers that we've started... So until then, here’s a little something. Then, just Below the video you can hear the finished track with vocals and the rest! Here is one of the tunes we recorded on the 22nd...enjoy! Danny and I got together today and jammed/recorded for about 3 hours. It was a very productive session and ought to yield several more tunes! Last night I mashed us a video for Skeeter...hope you like it. So... we're like on a roll. Today we finished up another one, called BROOMCLOSET. Last week we got together and did a mix down of 2 tunes rather than jammed, so we could start letting everybody hear this stuff. Enjoy! "Undertaker" goes out to PINKUS from the TEST APES. He wrote it, but we play it our way. Thanks, buddy! At the moment we've started recording 11 songs, and have written some that aren't recorded yet. Here's a video of Honky's version! Yup. We exist now... and we call ourselves the TEST APES. Much more to come soon-- We've been writing songs and recording them over the last few months, and some of it is ready to be mixed down so we can share it with everybody. In mid-August this year, the Melvins played in Seattle with my old band mate Jeff Pinkus’ band Honky opening up for two sold out nights at a club called “Neumos”. Much to their credit, The Melvins always seem to do something to spice up their shows and get folks to come out and see them again and again. The unique thing about the tour this time was not only that it was their 30th anniversary, which is a major achievement the more I think about it, but also that Pinkus played bass for the Melvins and Dale Crover played drums for Honky. It was interesting to see both bands with this mixed membership arrangement. And Melvins had a second drummer. Honky also had Danny Barnes (remember the ol’ Bad Livers?) sit in for a couple songs on electric banjo as well as a bit of singing. That first night was the first time I had gone out to see a show in over a year--it had not been that long between shows since I lived with my parents, like in the late 70’s when I was just plain too young! And I can enjoy being a hermit sometimes. But I was even letting myself down. Its tough being a single parent and all, and I never had enough “time”, “ energy” or “organization” to go out to see local talent to start to network. Or at least those are the 3 excuses I used. I had lived in Seattle from ’91-’93, so I am familiar with the area. But it had been 18 years since. So I know very few people, certainly few local musicians that are active. I also have no idea what clubs are good, bad, or even exist. I really am still starting over in many ways. So, like I said, they played two nights. Seeing a possible opportunity, the second night I made Danny a 4-song demo cd and brought it to the show. I knew as well as Pinkus that Danny lives in Port Townsend which is kinda far, but not too far. Sorta like driving from Austin to Waco...you could make it in around 2 hours. Lo and Behold, Danny started texting me. Soon, he was over for some visits to my apartment homestudio and we were working on writing and recording stuff, with plans on doing more recording and possibly even some show playing...we are currently trying to figure out a band name...! We are going to try to be able to be a two piece, but also be expandable... Stylistically, we seem to be a cross over of 1960‘sness, bluegrass, and rock, with electronica. We will be using both acoustic and electric instruments and both analog and digital devices. Multimedia aspects are already being explored. The use of songs as a landing pad for improvised transitions has been discussed, much like Pink Anvil did. While samplers will not be used, a loop station, analog synthesizer/sequencer, kaos pad and digital delay as well as a DVD player may.